The industry's standard for washing, chilling and sanitizing of lettuce, cabbage or any cut vegetable . Get longer shelf life and a better looking, crisper product for your customers. The system consists of a water flume, chilling system, de-watering conveyor, water reclaiming filter and stainless steel pump. Hydro Chiller System : Designed to chill and recycle the water. Water chilled to 34 to 38 degrees. The chiller is equipped with a stainless steel coil bundle for long life and ease of distribution of chilling agent. Compressor not included. 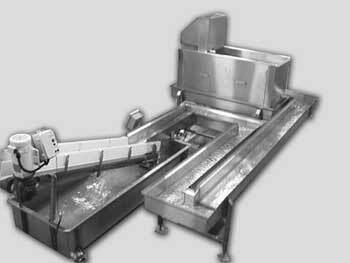 Flume System : This 30 to 35 foot long flume system is designed to wash and chill your fresh cut product at approximately 1,000 lbs per hour. De-Watering Conveyor : Removes excess water and delivers the product to the drying basket. Water Filtering System : Incorporates a BeeZee screen for removal of organic matter from the recycling process.